I used to believe that my classroom management plan would work for all my students. For the most part it did until about my tenth year of teaching. During my time in Louisiana, I learned a lot about behavior management, because there were so many students with behavior concerns. I think around this time I scrapped the textbook idea of a classroom management plan. What they don’t tell you in your education courses is your classroom management plan won’t work for all of your students. This ultimately sets you up for immediate failure. No teacher deserves to walk into a classroom unprepared to deal with the students they teach. 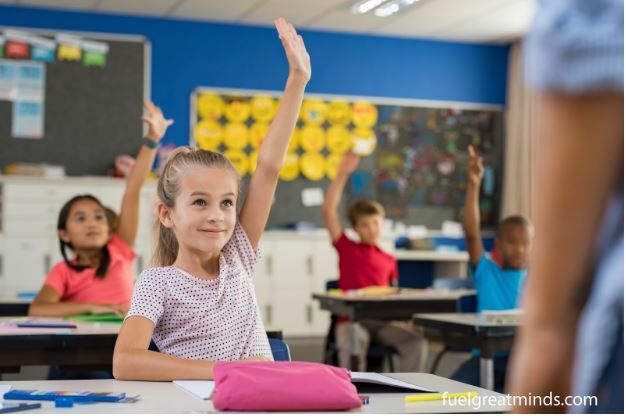 You can prepare yourself for students who won’t respond to your classroom management plan by implementing The 5 Step Process for Managing Student Behavior. Observe the student: When students don’t respond to your classroom management plan the first step should be to observe the student’s behavior. Classroom observations can be tough and emotions tend to cloud your view. Therefore, when you begin your observations make sure that you’re calm and remain calm during the entire observation process. Track student behaviors: I’ve found that conducting observations before tracking behavior works best. Some people say that you can’t see the forest for the trees. This is true when trying to track the student’s behavior before making observations. Most schools have behavior tracking charts or Antecedent, Behavior, and Consequence charts on their campuses. These charts are used to track the student’s behavior. Then they are used to make decisions about which behaviors to target in the Response to Intervention plan. Identify behavior triggers: Everybody has triggers; however students who don’t respond to classroom management plans are easily triggered. Most of the time you won’t know or understand why interactions with certain students will trigger a student or something you said sets the student off. Last week, a student in my class was supposed to walk across the street to the Boy’s and Girl’s club with the other children, but she was left behind due to her not being in the correct place for dismissal. As a result, I had to walk her across the street. The next day I told her that she needed to make sure that she’s in the library and not wandering the building, because I wasn’t walking her across the street again. After I told her that, the other teacher saw her going to the science lab with another student she went into a complete meltdown. She shoved books, broke pencils, and cried. I called her grandmother she informed me that by me saying that I wasn’t walking her across the street most likely triggered her. I was speechless because I had no clue! Identifying triggers can be tricky, but if you pay close attention and the student has a history you’ll be able to find them. Create a Response to Intervention Plan: A Response to Intervention plan is similar to a RTI plan for academics. The only difference is there are targeted behaviors and replacement behaviors. 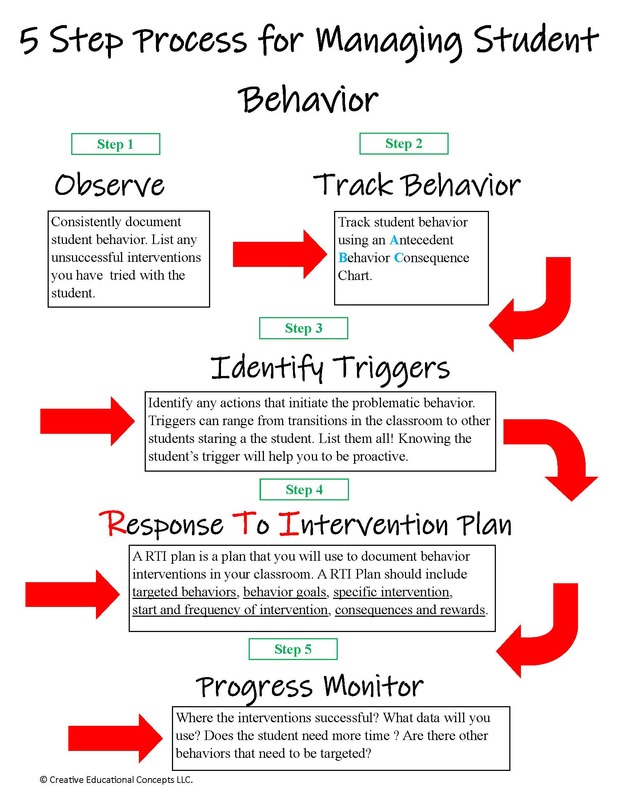 Targeted behaviors are those behaviors that you want to decrease and replacement behaviors are taught to the student to put in place of the targeted behavior. This part of the process may seem like a lot of work for you but trust me it’s not, because you will target the behavior that is causing the most problems in the classroom. These behaviors can range from mild to absolutely bizarre! Progress monitor: Progress monitoring is the last piece to managing student behavior. Like academics behavior strategies must be monitored. As with anything the process for managing student behavior has to be consistent in order to see any significant changes.